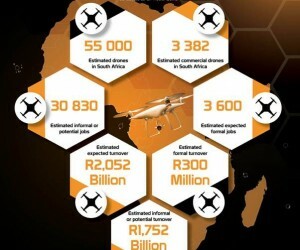 The Drone industry is poised to make a multibillion rand contribution to the country’s beleaguered economy, a leading economic expert revealed during an industry conference. Economist, Dr Roelof Botha was delivering his Economic Impact Assessment (EIA) of the South African Drone industry at a special conference last week, The Drone Con: A Drone Conference for Professionals. The event was sponsored by United Drone Holdings (UDH) – a leading innovative and entrepreneurial-focused commercial Drone business, committed to educating and developing the African Drone industry. “Botha, an economic advisor to the Commercial Aviation Association of South Africa (CAASA), has extensive experience in the economics of aviation. His research was commissioned by UDH in partnership with the Commercial Unmanned Aircraft Association of Southern Africa (CUAASA). “It is clear after comparing 2015 data to the latest economic impact assessment that the domestic Drone industry is expanding exponentially,” he said. 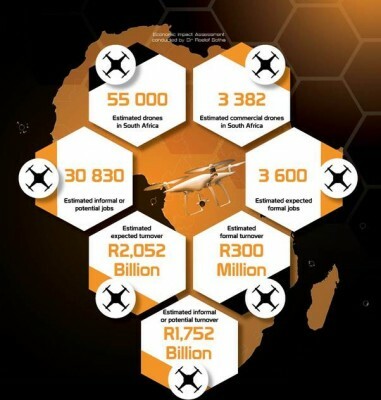 The latest research indicates that the total economic output generated by the Drone industry equates to an anticipated turnover of more than R2 Billion and should create in excess of 30 000 jobs in 2017. According to Botha, the methods used to determine his findings include distributing sample surveys among CUAASA members, estimating and concluding results and determining the average multiplier effects on the sector, as well as comparing results with SA/European Union and SA/United States GDP ratios. “Globally, technological advancement has transformed a vast number of industries over the past decade, but sectors such as real estate, mapping, infrastructure-monitoring and shipping have remained relatively unchanged. But Drones are in the process of dramatically changing these and a host of other applications,” Botha said. UDH CEO, Sean Reitz said the results are “really exciting” for the drone industry as well as the economy. “The commercial applications of Drones are limitless, they go where humans can’t or shouldn’t go and make tasks safer, faster and often more accurate. Drones have proved to be beneficial to many key industries. The economic impact assessment reveals that Drones have benefited our economy and will impact unemployment rates as well, which is very encouraging,” he said. But Botha added that while industry growth can be regarded with certainty, “inappropriate regulatory structures” are hindering progress. “Unless the South African transport authorities create a business-friendly and efficient set of regulations for commercial Drone activities, it may lead to a siphoning of jobs and economic activity to neighbouring states that do,” he said.